Don Maddox, the last surviving member of the wildly-influential Maddox Brothers & Rose, will be recognized in his hometown of Ashland, Oregon for his 90th birthday at the Don Maddox Birthday Celebration on Saturday, December 8th. 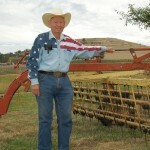 Don Maddox moved to Ashland, OR from California in the late 50’s after The Maddox Brothers & Rose disbanded, and bought a 300-acre cattle ranch where he’s been “hibernating” (in his words) from the music business for the last 54 years. 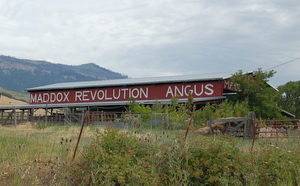 Don still works and lives on the remaining 80-acre parcel, where one of Ashland’s landmarks, Don’s “Maddox Revolution Angus” barn sits prominently on a hillside on the east side of town. The Maddox Brothers & Rose are one of the most influential bands in the history of American music. Don and his family migrated from Alabama in 1933 during the Depression to California, and became the first band to formulate what would later become known as the California country, West Coast, or Bakersfield Sound. They were called “The Most Colorful Hillbilly Band” and played shows with folks as far ranging as Ernest Tubb and Elvis Presley. It is said that Elvis when playing a show with The Maddox Family in Beaumont, TX was inspired by The Maddox Brothers’ colorful uniforms and adopted the fashion style himself. The Maddox Brothers and Rose were there at the beginning of the formation of country, rockabilly, and rock and roll music, and are given credit for influencing them all equally. Don Maddox has been enjoying a major resurgence in his musical career thanks to the re-popularization of the music of Maddox Brothers & Rose, and his own music he’s been releasing on his record label “Revolution Records”. 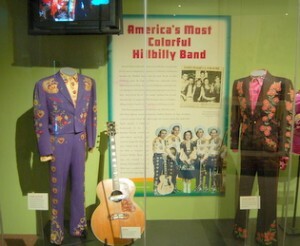 Don and The Maddox Brothers and Rose are heavily featured in a brand new exhibit at the Country Music Hall of Fame in Nashville, TN showcasing the Bakersfield Sound from California that Don and the Maddox Brothers were seminal in creating. When Merle Haggard was asked to be part of the opening ceremony for the Bakersfield Sound exhibit, he said, “If you don’t have Don Maddox out here for this, you may as well not have it at all.” During Don’s trip to Nashville for the opening of the exhibit, he was also invited on to the Grand Ole Opry where he received two standing ovations. He also has headlined the Muddy Roots Festival in Tennessee the last two years. Don Maddox’s 90th Birthday Celebration will feature performances by the Oregon Old Time Fiddlers, Sage Meadows and her band High Country, Don Maddox himself, and the legendary Ashland bluegrass group Siskiyou Summit, who was the backing band Don’s sister Rose Maddox for many years. Rose, who passed away in 1998, is buried in Ashland, as are all the members of Maddox Brothers & Rose. Don Maddox’s 90th Birthday Celebration will be from 2 to 6 PM, December 8th at the Ashland Community Center, located just across from Lithia Park at 59 Winburn Way, Ashland, OR 97520. Don’s actual birthday is Pearl Harbor day, December 7th. For more information and to purchase tickets, go to www.donmaddox.weebly.com. Is that presenter at the Ashland City Council you? Actually, now that I have read the article, obviously you were the presenter. Congratulations! How big of a country scene is there in Ashland, by the way? I’ve always thought of it as a rock-oriented town. It’s difficult to find much of a country scene in the West Coast except in California’s Central Valley. Did Hank 3’s One big wag DVD come out yet? No, it hasn’t. I’ve checked back almost every day on a link from Skeleton Crue, and it’s still not up. They told me it would be up 2 weeks ago. I hope they get it up before the end of the Christmas buying season. I know some folks were hoping to buy them for gifts.